If you watch birds at all, you’ve got to feel conflicted about blue jays. They’re beautiful. They’re bold and tough. I’ve always enjoyed watching their looping, swooping flight. They’re also noisy to a fault; calling them aggressive understates the case. 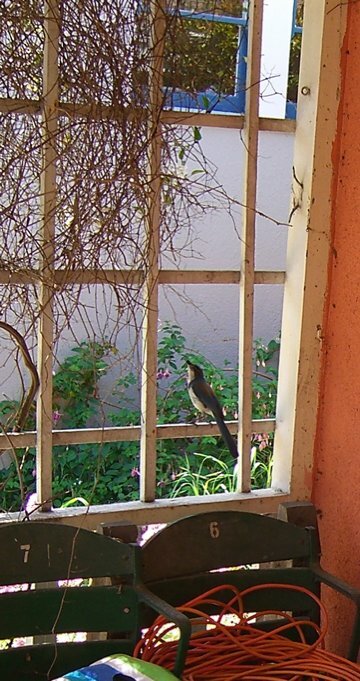 They’re opportunists of the first order, and if something weaker gives them an opening — like the towhees that built a nest next to our house last year only to watch a jay raid it and smash the eggs — they exploit it instantly. I tried to chase away the jay last year, but it was a lot better at its business that I was. It’s instinct, I know, not Karl Rove-like calculation, that drives the birds’ behavior (and I apologize to the birds, even if they’re mere beasts, for comparing them in any way to Karl Rove). This spring, a couple of western scrub jays have built a nest within a couple of feet of the one the towhees abandoned, with prejudice, last year. We can just see the new nest near the top of a potato bush growing along the side of our back porch: just a non-descript bundle of sticks. But a couple of jays have been back and forth from that spot for a good couple weeks. It’s too high to see into, and well enough screened that it was hard to see whether there were any eggs up there. Yesterday, one of the jays flew over my head to the nest. I could hear some weak little chirping. The new jays were hatched. Today, that chirping is a little louder. Now I find myself rooting for this little clutch of birds, even if they’re going to turn out to be a bunch of heartless (if handsome) marauders. 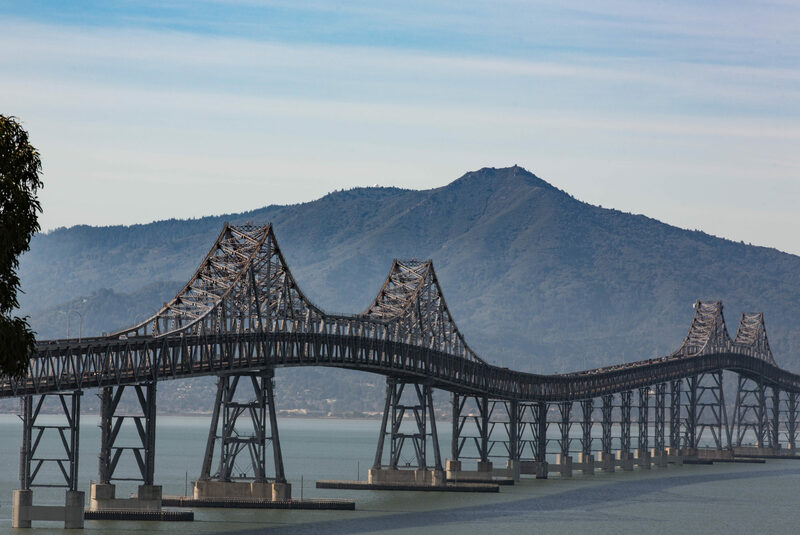 A gasoline tanker crashed on the biggest interchange in the Bay Area, the place where traffic exiting the Bay Bridge from San Francisco gets sent north, east and south to magical spots like Vallejo, Stockton, Hayward, and Fremont (and yes: Berkeley, too). The tanker caught fire after the crash, and the blaze’s intensity caused a section of aerial freeway to collapse onto the roadway where the truck was incinerated. Since the crash occurred at 4 a.m. on a Sunday morning, traffic was light and the only injury was to the truck driver, who suffered serious but not life threatening burns. The predictable result of the crash: Gawkers, including your faithful correspondent (FC) and close collaborator (CC), were out in force. At the point of the collapse, the freeway maze flies over a collection of railroad and heavy equipment yards, vacant lots, and a sewage plant. It’s not easy to find your way around down there, and the few places that might have given a decent vantage point of the carnage — a couple “Mad Max”-type surface streets and the parking lot for a big home improvement store — were blocked off to prevent the idle legions from satisfying their curiosity. We could see the collapsed section from 200 or 300 yards away from nearby streets, but couldn’t get any closer. 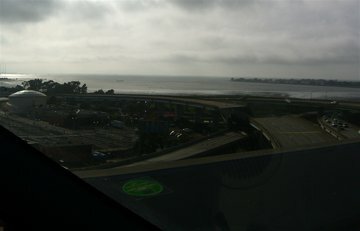 The best view turned out to be from the skyway that carries I-80 from West Oakland into Emeryville. The collapse was plainly visible from up there, though I tried to keep my attention on the road while CC snapped some shots. It’s not the first time something catastrophic has happened at or near this spot. 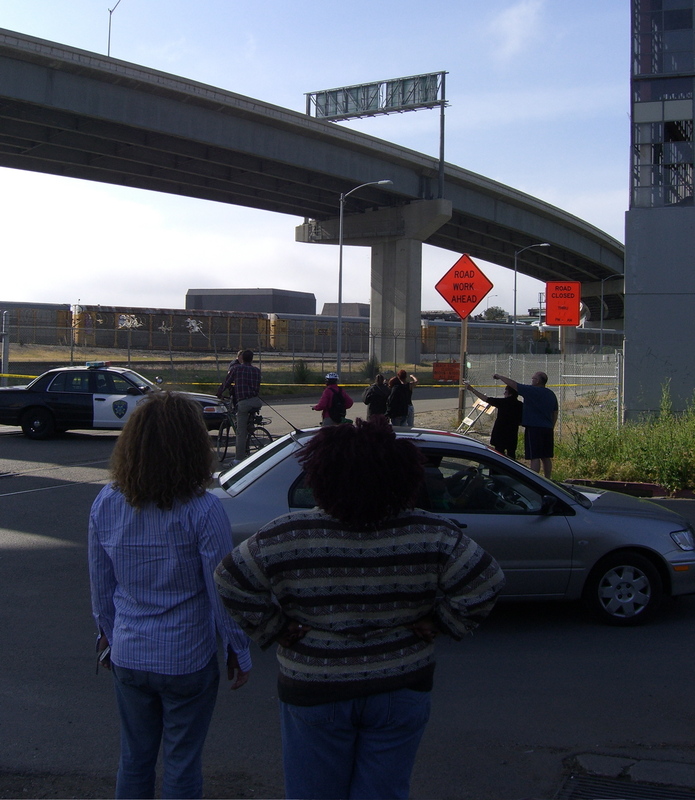 The interchange was reworked after the collapse of an adjacent double-deck freeway in the 1989 earthquake (42 people died there). The new ramp configuration has always seemed a little more challenging than an urban freeway ought to be: three lanes split into two directions — you can use the center lane to either go south on Interstate 880 toward San Jose or east on I-580 toward Stockton. 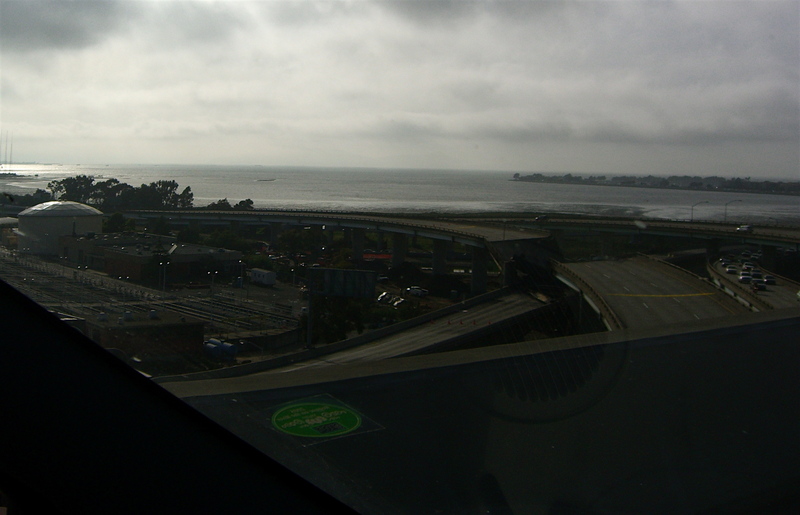 With normal daytime traffic, the ramp is a bottleneck that backs up traffic as much as a mile, into Berkeley. Late at night or early in the morning, when you can go normal California freeway speeds — 70 or 75 mph — the ramp is trouble. You hit it fast, and if you don’t know exactly where you’re going, the sharpness of the turns can throw you. The cops are saying the truck driver involved in this morning’s crash was going too fast and hit a guard rail and support column. From The New York Times: “Dean at M.I.T. Resigns, Ending a 28-Year Lie.” It’s the story of Marilee Jones, the university’s highly respected and successful admissions director, who over the decades falsely claimed to have received several college degrees. It turns out that she never graduated from college at all. Somehow M.I.T. only recently got around to looking into her resume, long after she had been elevated to senior administration. I suppose the absolutist side of me feels like she ought to suffer the severest consequences for her dishonesty. There’s the ethical question, of course, the need to be straight with others about who you are and what you’ve done. There’s another issue, too: being honest with yourself about your life. On one level, the sort of biography you present in a resume is the most superficial kind there is: just dates, places, duties, and positions; your resume doesn’t touch on the stuff that’s really hard to face, like all your personal crises and how you’ve dealt with them, the traumas you’ve suffered or dealt out, the messy details of how you deal with people and problems every day. So being candid about those surface details — “I graduated with honors” or “I made it to community college, but liked beer better; I still hope to go back some day” — seems like it should be the easy part about representing yourself. Unless you lie about it. Then you’ve created a secret that you must sense will emerge some day to show the world what a fraud you are. Ethical absolutism aside, I sympathize with Ms. Jones. Perhaps partly because I’m a fellow non-college graduate (my resume says where I went to school and notes “no degree taken” — though hope springs eternal). But more because it’s hard not to admire her when you read what she was able to do with her talents and ability — qualities that didn’t happen to come certified from an institution of higher education. At some juncture, or maybe many, she had to consider whether to come clean about her untruths. It must have been hard; I expect she sensed that advancement depended on having a degree, that she wouldn’t get a chance to show what she could do unless she had some credentials, whether they were truly relevant or not. She was probably right, and that’s a shame, because her work was brilliant. Not brilliant enough to offset her lies, though, or escape the trap she set for herself. First, this: An account of a cycling road race, the Hillsboro Roubaix, in what I’d call south-central Illinois. It’s a big state, and it’s full of stuff I’ve never heard of or dreamed existed. Just a few items that come to mind from the last several years: the car ferries on the Mississippi and Illinois rivers; the grave of Mother Jones; the national cemetery, mostly for Civil War dead, down at hardscrabble Mound City; the beautifully massive and useless flood gate in the levee at beaten-down Cairo, just a few miles from the cemetery. The account of this year’s Hillsboro Roubaix I linked to above is from a racer named Luke Seemann, who lives in Chicago. It’s a beautiful narrative on the course and a nice look at competitive road-racing tactics. Luke came in 11th in a tough race. Bravo on the result and on the write-up (a couple more excellent race accounts to check out from Mr. Seemann: from the 2006 Snake Alley Criterium (Burlington, Iowa) and the ’06 Baraboo (Wisconsin) road race). … and an explanation of the proprietor’s recent absence: I spent Saturday and Sunday on my bike, riding a 600-kilometer qualifying brevet for this year’s Paris-Brest-Paris; that’s 375 miles, roughly evenly divided between a very rainy Saturday and a beautiful if cool spring Sunday. So: I’ve finished all four qualifiers for PBP, and all I need to do now is maintain my edge for another four months, book a trip to France, get there, ride 750 miles or so in four days in late August. … Wait — let’s just take one thing at a time. expected to be in the upper 40s to about 50. Once upon a time, the idea of “the loner” extended beyond the way the term is nearly universally used in media today: for destructive psychopaths, after they’ve unleashed some horror or other. I carried on a little bit earlier about the Virginia Tech official who first uttered the term in connection to Cho Seung-Hui. It was true as far as it went — and that wasn’t far at all, as Cho demonstrated both in action and in his special delivery to NBC the other day. But those are sort of limited, shot-in-the-dark examples and ones that rely on the distortion and romance of fiction. I went looking for a little more evidence and context, and came upon the noble example of “The Loner,” a one-season, mid-’60s western series starring Lloyd Bridges (and created by Rod Serling). Then there’s Neil Young’s “The Loner,” which focuses on the menacing stranger. Still a long way off from real life. The Anneli lives less than two miles from us as the crow flies. I haven’t seen her in 25 years, since before she was Anneli. Now I know one reason why. But just one. “B. K. Blankchtein, a self-defense trainer and former member of the Israeli army, said the killer picked good weapons for his murderous purpose. “Blankchtein, general manager of the Owings Mills training facility of Krav Maga Maryland, said the Glock and Walther models are relatively affordable and easy to conceal. He said the Glock is particularly simple to use and fast to reload. ‘Straight out of the box, it’s probably the best firearm out there,’ he said. “Glock 9 mm pistols can be bought with 33-round magazines in some states — including Virginia, but not Maryland — but Blankchtein said the larger magazine might not have been needed. He said it takes just seconds for even a relative novice to eject one magazine and put in another. “Jim Purtillo, editor and published of the pro-gun rights newsletter Tripwire, said much of the blame for the high death toll should go to the administration of Virginia Tech for its policy prohibiting the carrying of concealed weapons on campus. He said that if other students in the vicinity had been carrying guns they would have had a chance to stop the killer. You know, I’d like to honor Purtillo and all those who think the answer to the violence among us is more guns. I’d like to give him and his free-thinkin’, free-shootin’ cousins a slice of territory they could call their own; a place where they could make all the laws and enforce them with their guns; a place with a nice stout wall around it to stop the stray bullets from flying out and ruining my vegetarian cookouts; a place you could call Gunsylvania. Recommended: The Washington Post’s long writeup this morning on what’s known about Cho Seung-Hui, the student responsible for Monday’s Virginia Tech slaughter. The story is full of details that convey the kid’s isolation and the sense of menace he apparently conveyed — in one case, 63 of 70 students stayed away from a poetry class he attended because they were reportedly scared of Cho — that I haven’t seen anywhere else. For extra credit, the reporters and editors managed to put together an 1,800-word piece without once describing the subject as “a loner.” That’s almost worth a Pulitzer right there. “[Poet and poetry instructor Nikki] Giovanni said she appealed to [Professor Lucinda] Roy, who then taught Cho one-on-one. Roy, 51, said in a telephone interview that she also urged Cho to seek counseling and told him that she would walk to the counseling center with him. He said he would think about it. “Roy, now the alumni distinguished professor of English and co-director of the creative writing program, said university officials were responsive and sympathetic to her warnings but indicated that because Cho had made no direct threats, there was little they could do. I broke down and turned on CNN to check out coverage of the Virginia Tech shooting. I see there and elsewhere, without really knowing the details from this morning’s mayhem, that the media are turning to the question of what it all means. With the help of sociologists, CNN bloviator in chief Lou Dobbs is going to scrutinize school shootings. It’s an unspeakable tragedy, of course, and what will come to distinguish it will be the awful, heartbreaking details to be revealed over the hours and days to come. But really: does this tell us anything about any aspect of our society that we didn’t know before this morning? Or before Columbine? Or the Killeen, Texas, massacre? Or Oliver James Huberty’s slaughter of the innocents at the San Ysidro McDonald’s. Go ahead and jump in — you can all think of an incident that fits. I’m not sure what any of these killings says, by the way, beyond the obvious: how violent the society is, how efficient firearms are at doing what they’re designed to do. But regardless of the meaning, to me, these have come part of the landscape we live in, a little like earthquakes in California. You know they’re coming; you know they could be devastating; but you never know when it’s going to happen. Of course, unlike earthquakes, in theory, at least, there’s the hope we might be able to do something to stop random massacres. After every one, there’s lots and lots of talk; Lou Dobbs and his sociologists. Then — then we move on, till the next time.